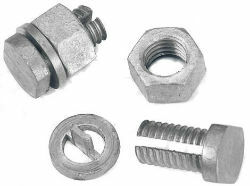 Die cast zinc split bolt and washer with galvanized steel nut provide trouble-free connections. Use to connect hook-up or grounding wire to fence. Not a splice. Split bolt style.